The Dakota Chamber Music is celebrating its 20th anniversary through Sunday (June 26). The institute brings professional artists together with talented and motivated students and adults for intensive performance and study. Minot State University’s resident trio, Luminus, forms the core of the 2016 DCM faculty. 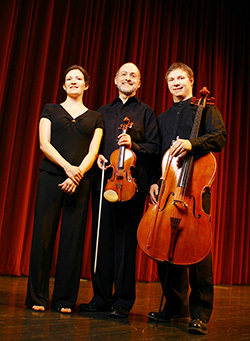 Erik Anderson, cello, Dianna Anderson, piano, and Jon Rumney, violin, comprise the trio. A faculty concert is Friday (June 24) at 7:30 p.m. Admission is $10 for adults and $5 for students. Concerts by DCM students are Saturday (June 25) at 7 p.m. and Sunday (June 26) at 1 p.m. Admission is free. All concerts are in Ann Nicole Nelson Hall and are open to the public. For questions, contact Erik Anderson, professor of music, at 858-3576 or erik.anderson@minotstateu.edu. Pictured, left to right, are Dianna Anderson, Jon Rumney and Erik Anderson. Touted as one of the funniest farces ever written, Michael Frayne’s “Noises Off” returns to the MSU Summer Theatre stage under Minot State University alumnus Joe Koppinger’s direction Tuesday (June 28) through July 2. Audiences will be delighted with a manic menagerie of actors and comedic chaos … and an errant herring. Love conquers the Western Indian Territory at the turn of the 20th century in Rogers and Hammerstein classic, “Oklahoma!” July 13-17, under the direction of Chad Gifford, Summer Theatre associate director of production. Laurey must decide between two suitors, Curley, a boisterous cowboy, and his rival, Jud, an obsessive farmhand. To save Curley from harm, Laurey accepts Jud’s invitation to a social. All performances begin in the amphitheater at 8:30 p.m. with the box office opening at 7:30 p.m. Ticket prices are: $12 adults, $10 seniors, students and military with ID, $8 for children (12 and under), $5 for MSU summer students, faculty and staff with current MSU ID. Reservations, which are strongly recommended, begin May 31. For reservations or questions, call 858-3228. Three stops remain on Minot State University’s 11th annual Friend-raising Golf Tour: Garrison on July 12, Bottineau on June 14 and Kenmare on Aug. 4. MSU will recognize area students receiving 2016-17 scholarships at each event. The format for each tour stop is a four-person, 9-hole scramble. Registration begins at 4:30 p.m., with a shotgun start at 5 p.m. A social immediately follows completion of golf. Non-golfers are welcome to attend. Golfers are responsible for their own green fees and cart rentals. Meals and refreshments are provided by the course, and purchase is optional. It is recommended that golfers interested in carts make early reservations because of limited availability. Prizes and T-shirts will be awarded at each event. The Friend-raising Golf Tour is sponsored by Alumni Association, Advancement Office, Athletic Department and the Marketing Office. Call the MSU Advancement Office with questions or to register at 858-3234 or 701-800-777-0750, ext. 3234, or visit the website, www.minotstateu.edu/alumni. KaDee Simensen Lopez, owner of Bricks Fitness, will donate a WELLBEATS kiosk to Minot State University. With the WELLBEATS kiosk, the Student Wellness Center can offer fitness and wellness programming anytime. Bricks Fitness closed June 1 after being in business for 10 years. WELLBEATS, a leading virtual fitness provider, delivers a convenient approach to group fitness with its accessible options to a variety of fitness class formats. The kiosk gives users the ability to hit “play” on classes that are of interest to them on their own timelines. The on-screen instructors will show modifications and challenges to meet a variety of user needs. For questions, contact Brekke at paul.brekke@minotstateu.edu. 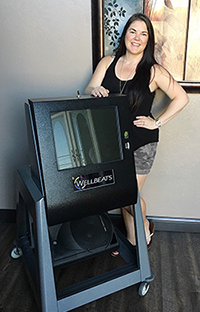 Pictured is Simensen Lopez with the WELLBEATS kiosk. 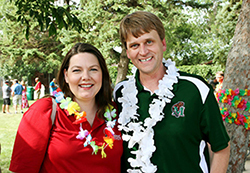 Minot State University invites alumni and friends to a luau party at the North Dakota State Fair on July 27, 5-8 p.m. The event will be in the outdoor area of the Flickertail Gardens, and admission is free. The MSU luau provides the venue for Minot State supporters to rekindle old friendships and create new memories. There will be music, drink specials and prizes. For questions, contact McKechnie at janna.mckechnie@minotstateu.edu or 858-3234. Minot State University welcomes new employee, Tamara Roskam, copier and binding technician in the Office of Publications and Design Services. In 2009, Roskam earned a bachelor’s degree in community health from Eastern Washington University. She enjoys spending time with her husband, Chris, and their two dogs. She also volunteers with the American Red Cross. June 22-30 — North and South Dakota Photography Group Show, Library Gallery. June 22-July 15 — “Inspired by Shadow,” paintings by Burlington artist Donna Watts, Hartnett Gallery. On June 9, Linda Benson, public information specialist, was inducted into the Dakota State Eagles Auxiliary Hall of Fame. This is the highest award given by the Dakota State Auxiliary of the Fraternal Order of Eagles. On June 10, the Dakota State Auxiliary installed Bev Alex, Department of Athletics administrative assistant, and Benson, as officers for North and South Dakota. Alex is the treasurer, and Benson is a trustee.